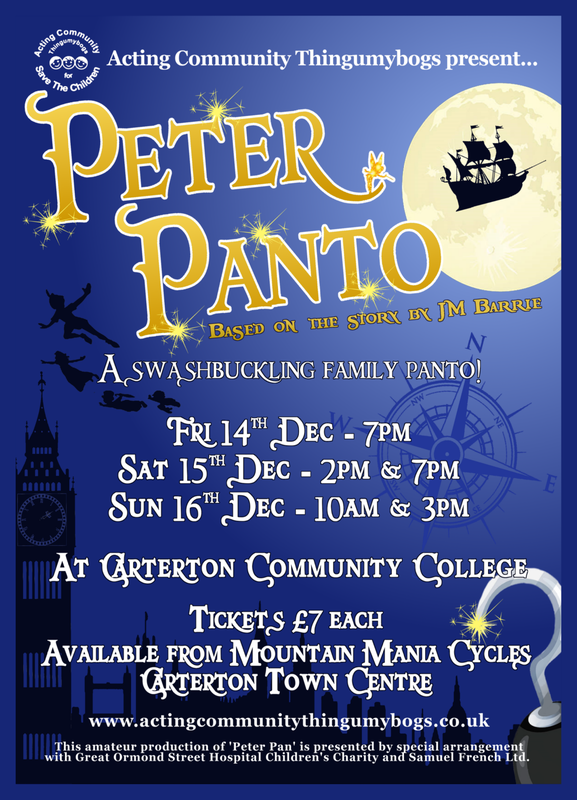 Our Christmas Pantomime - 'Peter Panto'! Christmas is nearly upon us and that can only mean one thing... pantomime! This year Carterton's amateur dramatics group, Acting Community Thingumybogs, present 'Peter Panto', (very loosely based on the classic story by J M Barrie…). Come along and boo, hiss, clap, cheer and laugh as we follow Peter Pan, Wendy, Michael & John on their adventure to Neverland as they meet the lost boys, mermaids, indians and pirates! Meanwhile Captain Hook plots his revenge but the crocodile has other ideas…Will Peter Pan ever grow up? Can Tinkerbell and Wendy ever become friends? Will Captain Hook escape the crocodile? Packed with songs, slapstick, silliness and fairytale magic for the whole family to enjoy. on Fri 14th (7pm), Sat 15th (2pm & 7pm) and Sun 16th (10am & 3pm) December. Tickets are £7 each available from Mountain Mania Cycles in Carterton Town Centre.